Installing Add-ons feature is great way to extend any browser features like Internet Explorer (IE). But in many cases add-ons may become a big problem to their users, As they might pose some security risk or slow browser issues. Many adware add-ons also get installed in your browser when you visit untrusted or spammy websites. 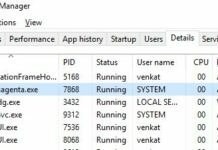 If you have suspected that your add-on Extensions has started causing problems in your Internet Explorer (IE) browser, It’s good to remove them or Disable them. If you don’t know how to Disable and remove internet explorer add-ons Extensions permanently, This article is made for you. 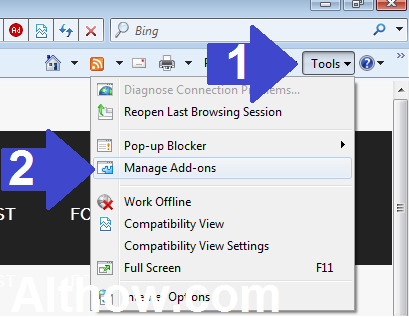 In this article I’m going to Show all the possible ways step by step to help you Disable and remove Internet Explorer (IE) add-ons. 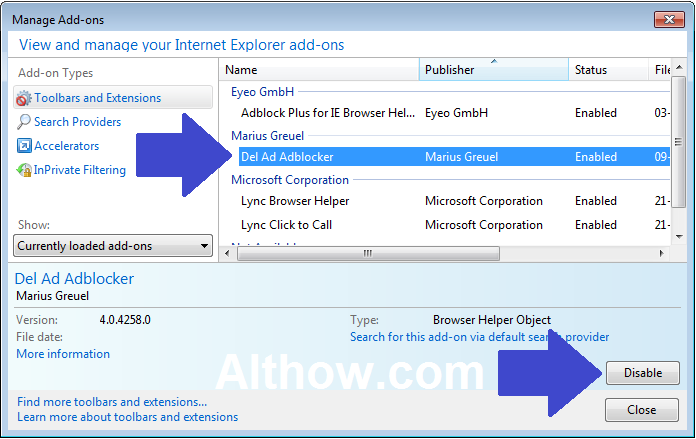 Read step by step Tutorials below to disable or remove your IE add-ons. Open your Internet Explorer (IE) Browser. 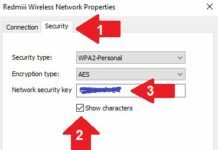 If you are Not able to open Internet Explorer Due to add-ons and It’s getting stuck, or getting Hanged, You can open Internet Explorer Using below step. Press The CTRL+SHIFT+ESC at the same time to open Task Manager, Click Processes Tab > Scroll Down and highlite iexplore.exe > Click End Process To close the IE browser In Background. Press Windows+R keys at the same time to open the Run dialog box, Type iexplore.exe –extoff and Hit Enter. 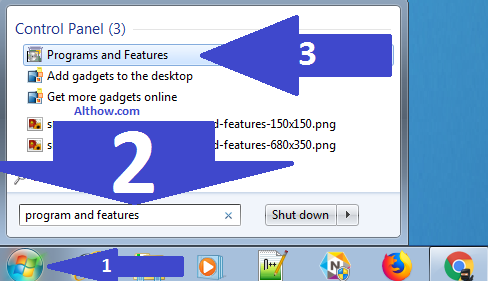 Select Tools button on the top right corner of your Internet Explorer browser, and then click Manage add-ons. Now Manage add-ons screen will appear, Under Show select the All add-ons to view all installed addons on your browser. Highlight the add-ons you want to disable and click Disable on bottom right corner of your window. You may not see remove button inside your Manage add-ons window, Because Internet Explorer Add-ons are installed inside program and features. Follow below steps to remove your IE Add-ons. 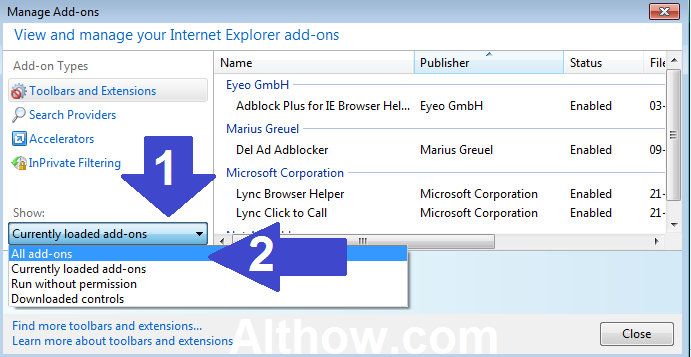 Now inside the Programs and Features Window you Will see some program names related to your Internet Explorer Add-ons, Highlight the program(Add-on) you Want to remove and Click Uninstall. 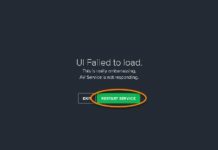 After Clicking on Uninstall button, Follow the instructions which will come on your screen and you are done. That’s it, Thanks for reading my article about How to Disable and remove internet explorer add-ons permanently. You can also read some related articles about how to Disable or remove Extensions on Mozilla Firefox and How to disable or remove Extensions on Google Chrome Browser Permanently.